Previous works suggest decadal predictions of Sahel rainfall could be skillful. However, the sources of such skill are still under debate. In addition, previous results are based on short validation periods (i.e. less than 50 years). In this work we propose a framework based on multi-linear regression analysis to study the potential sources of skill for predicting Sahel trends several years ahead. We apply it to an extended decadal hindcast performed with the MPI-ESM-LR model that span from 1901 to 2010 with 1 year sampling interval. Our results show that the skill mainly depends on how well we can predict the timing of the global warming (GW), the Atlantic multidecadal variability (AMV) and, to a lesser extent, the inter-decadal Pacific oscillation signals, and on how well the system simulates the associated SST and West African rainfall response patterns. In the case of the MPI-ESM-LR decadal extended hindcast, the observed timing is well reproduced only for the GW and AMV signals. However, only the West African rainfall response to the AMV is correctly reproduced. Thus, for most of the lead times the main source of skill in the decadal hindcast of West African rainfall is from the AMV. The GW signal degrades skill because the response of West African rainfall to GW is incorrectly captured. Our results also suggest that initialized decadal predictions of West African rainfall can be further improved by better simulating the response of global SST to GW and AMV. Furthermore, our approach may be applied to understand and attribute prediction skill for other variables and regions. 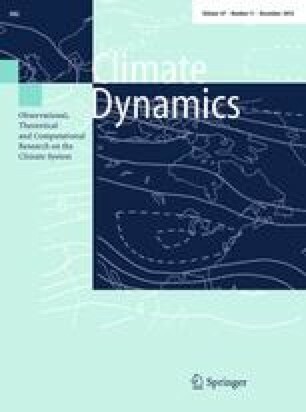 This paper is a contribution to the special issue on West African climate decadal variability and its modeling, consisting of papers from the West African Monsoon Modeling and Evaluation (WAMME) and the African Multidisciplinary Monsoon Analyses (AMMA) projects, and coordinated by Yongkang Xue, Serge Janicot, and William Lau. We thank the two anonymous reviewers and the editor for their comments and suggestions that helped improve the first version of the manuscript. This work was supported by a grant from Iceland, Liechtenstein and Norway through the EEA Financial Mechanism. Operated by Universidad Complutense de Madrid (Reference 011-ABEL-IM-2014A). It also received contributions from the European Union Seventh Framework Programme (FP7/2007-2013) under Grant Agreements Nos. 603521 and 308378, the German Federal Ministry of Education and Research (BMBF) Project MiKlip-DroughtClip (FKZ 01LP1145A), the Spanish Project CGL2012-38923-C02-01, and from Research Council of Norway (233680/E10). Special thanks are due to Wolfgang Müller for the discussion and for providing data of the MPI-ESM-LR decadal hindcasts. N.K. received support from the ERC STERCP project (Grant Agreement No. 648982).